Exercise 33A pg. 505 - 510 Im making these notecards to help, so if you use them, please sign up and help add more notecards! And dont forget to rate my helpfulness!! CORRECTLY IDENTIFY EACH TRACE, VALVE CLOSINGS AND OPENINGS, AND EACH TIME PERIOD OF THE CARDIAC CYCLE. WHEN ARE THE AV VALVES CLOSED? WHAT EVENT WITHIN THE HEART CAUSES AV VALVES TO OPEN? WHEN ARE THE SEMILUNAR VALVES CLOSED? WHAT EVENT CAUSES THE SEMILUNAR VALVES TO OPEN? VENTRICULAR PRESSURE> PRESSURE IN THE GREAT ARTERIES (AORTA AND PULMONARY TRUNK)LEAVING THEIR CHAMBERS. ARE BOTH SETS OF VALVES CLOSED DURING ANY PART OF THE CYCLE. IF SO, WHEN? YES THEY ARE; MOMENTARILY AFTER ATRIAL SYSTOLE AND VENTRICULAR SYSTOLE. ARE BOTH SETS OF VALVES OPEN DURING ANY PART OF THE CYCLES? AT WHAT POINT IN THE CARDIAC CYCLE IS THE PRESSURE IN THE HEART HIGHEST? Ok, so you’re using my notecards which is great. I am glad I could help you out cause I wish I had someone to help me out when I took this course. I know Anatomy is super hard. I only ask that if you find these notecards helpful, you join Easy Notecards and create at least one notecard set to help others out. It can be for any subject or class. Thanks and don’t forget to rate my helpfulness! AT WHAT POINT IN THE CARDIAC CYCLE IS THE PRESSURE IN THE HEART LOWEST? WHAT EVENT RESULTS IN THE PRESSURE DEFLECTION CALLED THE DICROTIC NOTCH? MOMENTARY INCREASE IN AORTIC PRESSURE THAT OCCURS WHEN ITS SEMILUNAR VALVE SNAPS SHUT. IF AN INDIVIDUAL'S HEART RATE IS 80 BEATS/MIN, WHAT IS THE LENGTH OF THE CARDIAC CYCLE? WHAT PORTION OF THE CARDIAC CYCLE IS SHORTENED BY THIS MORE RAPID HEART RATE? WHAT TWO FACTORS PROMOTE THE MOVEMENT OF BLOOD THROUGH THE HEART? THE MONOSYLLABLES DESCRIBING THE HEART SOUNDS ARE __1__. THE FIRST HEART SOUND IS A RESULT OF CLOSURE OF THE __2__ VALVES, WHEREAS THE SECOND IS A RESULT OF CLOSURE OF THE __3__ VALVES. THE HEART CHAMBERS THAT HAVE JUST BEEN FILLED WHEN YOU HEAR THE FIRST HEART SOUND ARE THE __4__, AND THE CHAMBERS THAT HAVE JUST EMPTIED ARE THE __5__. IMMEDIATELY AFTER THE SECOND HEART SOUND, BOTH THE __6__ AND __7__ ARE FILLING WITH BLOOD. 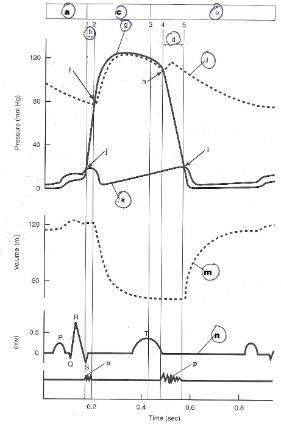 WHICH VALVE IS HEARD MOST CLEARLY WHEN THE APICAL HEARTBEAT IS AUSCULTATED? PULSE PRESSURE CAUSED BY THE EJECTION OF BLOOD FROM THE LEFT VENTRICLE INTO THE AORTA PRODUCES A PRESSURE WAVE (PULSE) THAT TRAVELS RAPIDLY ALONG THE ARTERIES. DESCRIBE THE PROCEDURE USED TO TAKE THE PULSE. THE PULSE IS THE AMOUNT OF BEATS PER MINUTE THAT YOUR HEART DOES. USE TWO FINGERS TO FIND THE PULSE (THERE ARE DIFFERENT AREAS ON THE BODY THAT THESE CAN BEST BE FOUND, BEST ARE THOSE CLOSEST TO THE SURFACE OF THE SKIN.) MOST COMMON ARE RADIAL AND CAROTID. COUNT THE BEATS FELT FOR A TIME AND MULITPLY TO GET 60 SECONDS. E.G. 15 SEC X 4. DORSALIS PEDIS ARTERY AND POSTERIOR TIBIAL ARTERY. WHEN YOU WERE PALPATING THE VARIOUS PULSE OR PRESSURE POINTS, WHICH APPEARED TO HAVE THE GREATEST AMPLITUDE OR TENSION? WHY DO YOU THINK THIS WAS SO? CAROTID ARTERY; BECAUSE IT IS THE CLOSEST TO THE HEART. ASSUME SOMEONE HAS BEEN INJURED IN AN AUTO ACCIDENT AND IS HEMORRHAGING BADLY. WHAT PRESSURE POINT WOULD YOU COMPRESS TO HELP STOP BLEEDING FROM EACH OF THE FOLLOWING AREAS? HOW CAN YOU TELL BY SIMPLE OBSERVATION WHETHER BLEEDING IS ARTERIAL OR VENOUS? YOU MAY SOMETIMES OBSERVE A SLIGHT DIFFERENCE BETWEEN THE VALUE OBTAINED FROM AN APICAL PULSE (BEATS/MIN) AND THAT FROM AN ARTERIAL PULSE TAKEN ELSEWHERE ON THE BODY. WHAT IS THIS DIFFERENCE CALLED? WHAT IS THE NAME OF THE INSTRUMENT USED TO COMPRESS THE ARTERY AND RECORD PRESSURES IN THE AUSCULTATORY METHOD OF DETERMINING BLOOD PRESSURE? WHAT ARE THE SOUNDS OF KOROTKOFF? SOUNDS OF KOROTKOFF ARE PRODUCED WHEN BLOOD PRESSURE IS TAKEN. BLOOD FLOW PRODUCES VIBRATIONS IN THE BLOOD AND SURROUNDING TISSUES THAT CAN BE HEARD THROUGH THE STETHOSCOPE, THESE SOUNDS ARE CALLED KOROTKOFF. WHAT CAUSES THE SYSTOLIC SOUND? SYSTOLIC SOUND IS THE FIRST SOUND HEARD UNDER PRESSURE. AS THE PRESSURE IS RELEASED AND THE ARTERY CAN NO LONGER STAY CLOSED, AS BLOOD BEGINS TO FLOW THROUGH THE VIBRATIONS MAKE THIS FIRST SOUND. WHAT CAUSES THE DISAPPEARANCE OF THE SOUND? DISAPPEARANCE IS CONSIDERED DIASTOLIC BLOOD PRESSURE. BP 145/85, PULSE 82 BPM. 145 PRESSURE IT TAKES YOUR BLOOD TO PUSH THROUGH VASCULAR SYSTEM WHILE YOU HAVE IT RESTRICTED. 85 IS LEAST AMOUNT OF PRESSURE NEEDED TO FLOW THROUGH VEINS WITHOUT PRESSURE. 82 IS AMOUNT OF HEART BEATS PER MINUTE. COMPLETED CARDIAC CYCLES (82) IN ONE MINUTE. HOW DO VENOUS PRESSURES COMPARE TO ARTERIAL PRESSURE? WHY? WHAT MANEUVER TO INCREASE THE THORACIC PRESSURE ILLUSTRATES THE EFFECT OF EXTERNAL FACTORS ON VENOUS PRESSURE? HOW IS THIS PREFORMED? WHAT EFFECT DO THE FOLLOWING HAVE ON BLOOD PRESSURE? IN WHICH POSITION (SITTING, RECLINING, OR STANDING) IS THE BLOOD PRESSURE NORMALLY THE HIGHEST? THE LOWEST? WHAT IMMEDIATE CHANGES IN BLOOD PRESSURE DID YOU OBSERVE WHEN THE SUBJECT STOOD UP AFTER BEING IN THE SITTING OR RECLINING POSITION? WHAT CHANGES IN THE BLOOD VESSELS MIGHT ACCOUNT FOR THE CHANGE? AFTER THE SUBJECT STOOD FOR 3 MINUTES, WHAT CHANGES IN BLOOD PRESSURE WERE OBSERVED? HOW DO YOU ACCOUNT FOR THIS CHANGE? The blood pressure evened out back to normal, took 3 minutes for blood to be distributed normally to and from the heart to body. WHAT WAS THE EFFECT OF EXERCISE ON BLOOD PRESSURE? WHAT WAS THE EFFECT OF EXERCISE ON PULSE RATE? DO YOU THINK THESE EFFECTS REFLECT CHANGES IN CARDIAC OUTPUT OR IN PERIPHERAL RESISTANCE? WHY ARE THERE NORMALLY NO SIGNIFICANT INCREASES IN DIASTOLIC PRESSURE AFTER EXERCISE? WHAT EFFECTS OF THE FOLLOWING DID YOU OBSERVE ON BLOOD PRESSURE IN THE LABORATORY? WHAT DO YOU THINK THE EFFECT OF HEAT WOULD BE? WHY?